Filipino-American children celebrate Jose Rizal’s 150th birthday! To celebrate Dr. Jose Rizal’s 150th birthday, Paaralang Pinoy of Northern Virginia organized a free workshop for young Filipino-American children at St. Bernadette’s Catholic School in Springfield, Virginia on Sunday, November 20, 2011. During the workshop, Ms. Realista Realica Rodriguez, Paaralang Pinoy’s Culture Coordinator, read Rizal’s story of the greedy monkey and the clever turtle (The Monkey and the Turtle). Ms. Diane Sebastian-Auclair, Paaralang Pinoy’s Language Coordinator, led the children in an acting workshop simulating the characters of Matsing (monkey) and Pagong (turtle). The children likewise learned the Cariñosa, a folkdance believed to be popular during Rizal’s time. The highlight of the workshop was the student’s interview with three of Rizal’s relatives, led by Ms. Anna Bantug-Herrera. Ms. Becky Bantug (Anna’s mom), Mr. Toby Bantug (Anna’s brother), and Anna’s and Toby’s young children, also participated. Anna and Toby Bantug are the fifth-generation descendants of Narcisa, Rizal’s third eldest sibling. Rizal’s relatives, including Ms. Maricel Lopez-Bretault, granddaughter of Paciano Rizal, are returning to Paaralang Pinoy on January 8, 2012 for another Rizal-themed workshop. In this workshop, the students will visit with Rizal’s relatives, learn Rizal’s poem Sa Aking mga Kababata, act out the Matsing and Pagong story, learn Florante’s song that praises Rizal’s patriotism: Akoy’ Isang Pinoy, and rehearse the Cariñosa dance. The children will also present the above poem, dance, story, and song during their graduation on Sunday, May 6, 2012. 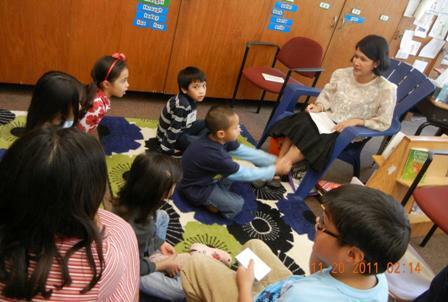 Paaralang Pinoy of Northern Virginia is a volunteer-run, language and culture heritage program for Filipino-American children. The mission of Paaralang Pinoy is to help Filipino-heritage children appreciate Filipino culture and learn Tagalog. Classes are held on most Sunday afternoons from October through May at St. Bernadette Catholic School, Springfield, VA, 22152, USA. For more information about Paaralang Pinoy, check out our website: http://www.paaralangpinoy.org or email us at paaralang.pinoy@yahoo.com.